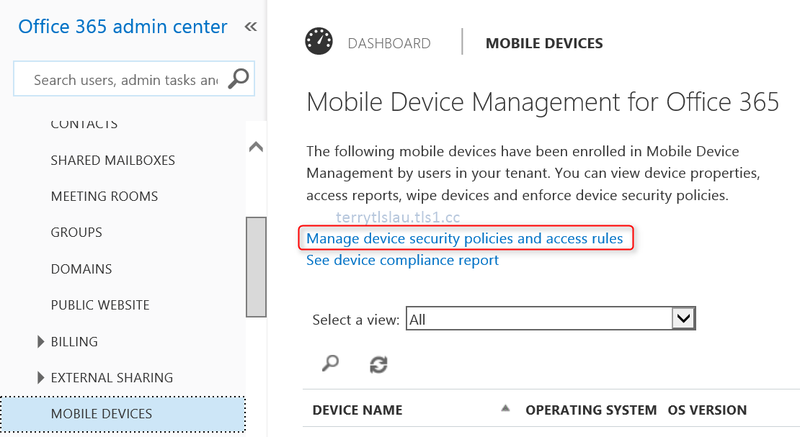 In part 1, Mobile Device Management has been enabled on Office 365 account. The APNs certificate has been added into this Office 365 account and added required CNAME on the domain. 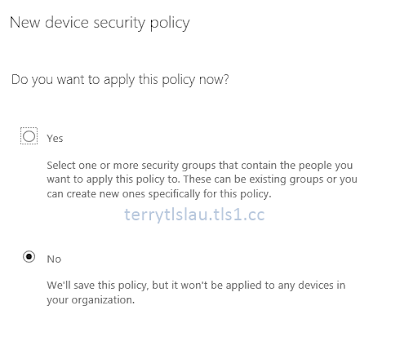 In this part, I'm going to configure security policies for Mobile Device Management on Office 365. As previous exchange connection, we used Exchange ActiveSync to connect to the Exchange Servers to sync email on Mobile Devices. Then, Exchange ActiveSync will apply the security policies to mobile devices which connected to Exchange Server. 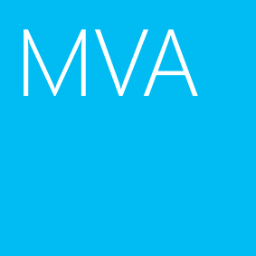 A few month ago, Microsoft announced Mobile Device Management for Office 365. 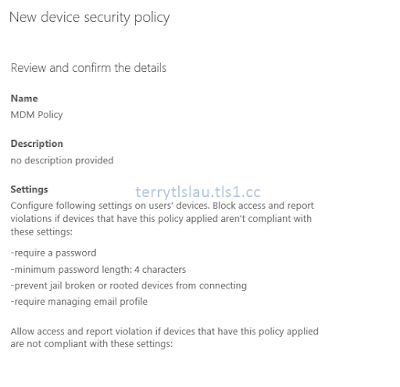 It enhanced the protection to connect Office 365. Using Mobile Device Management, we can check mobile devices jailbreak or not. If yes, the device cannot be connected to Office 365 to get any email contents. It can reduce to leak the company data. 1. On Office 365 admin center, log in as Global Administrator. 3. 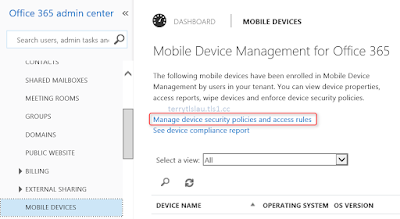 On "Mobile Device Management for Office 365" page, click "Manage device security policies and access rules". 4. On "Mobile device management" page, click "+" button. 5. 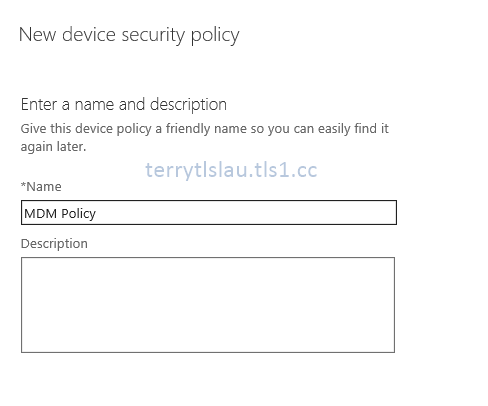 On "New device security policy" page, under "Name", enter "MDM Policy" and then click "Next". 6. 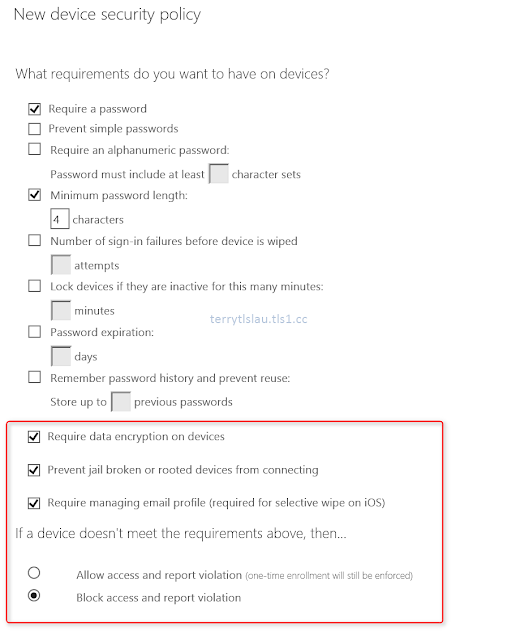 On "What requirements do you want to have on devices" page, you can find some new security settings which are provided by Office 365. 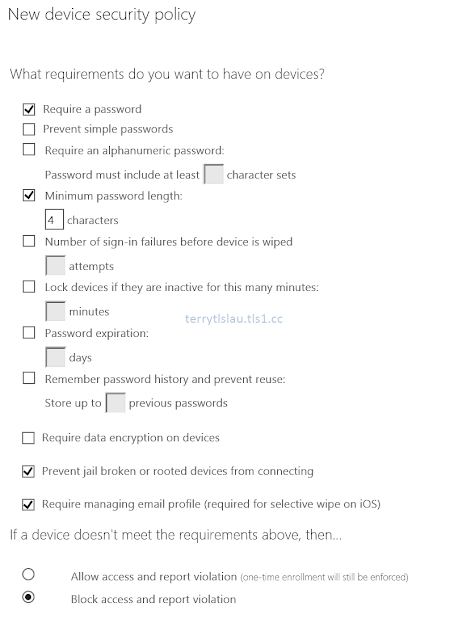 Remark: On Exchange ActiveSync mailbox policy, we can configure password related to mobile devices. 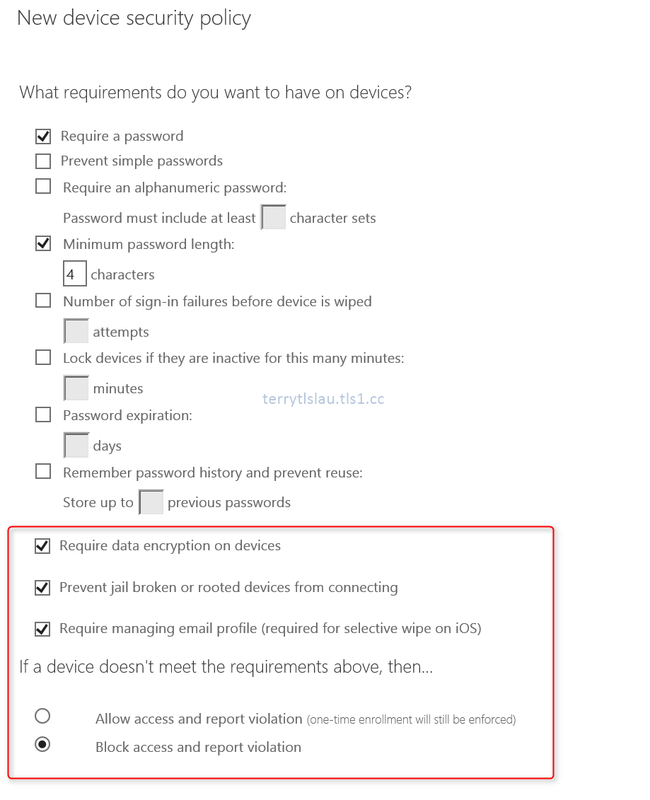 Microsoft added these above features to check device encryption, jail broken and control to connect to Office 365. It's a common MDM feature. Eventually, I configures the following security options for testing on this page. 8. 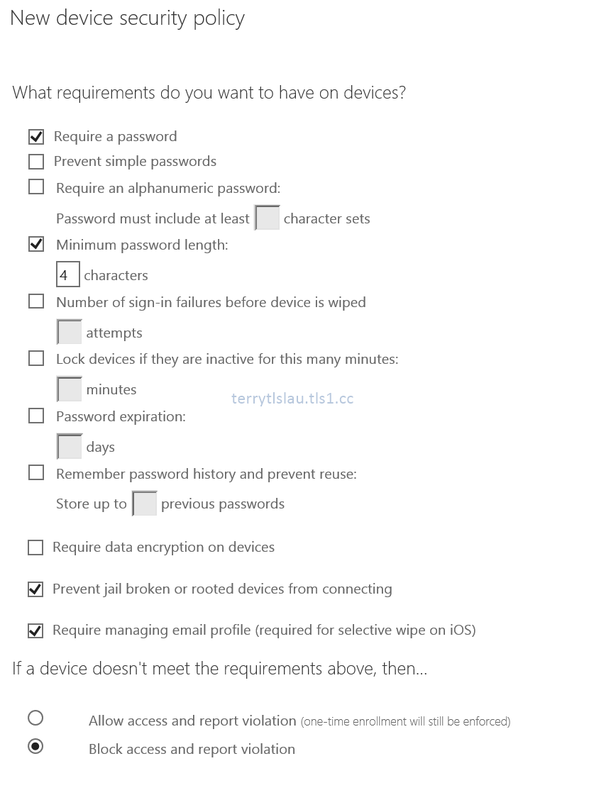 On "What else do you want to configure" page, there are the following options to control the devices. 9. I leave default settings and then click "Next". Remark: Based on above security policies, Microsoft doesn't define any specific policy or restrictions for different platforms. 10. 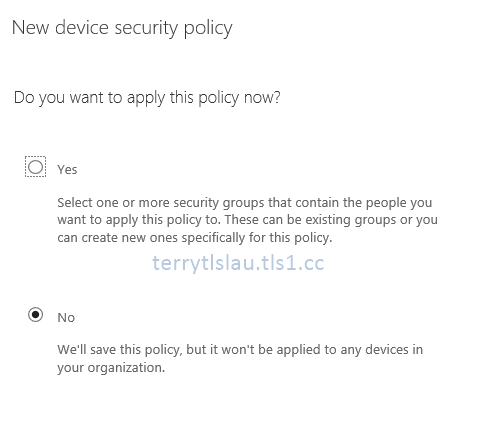 On "Do you want to apply this policy now" page, select "No" and then click "Next". 11. On "Review and confirm the details" page, click "Finish". Now, we can add or create a new group into MDM policy for testing. 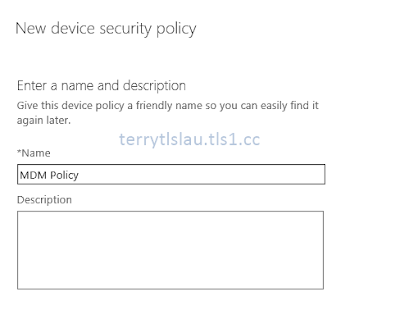 In this part, I configured the MDM security policy for mobile devices. In coming parts, I'll update the test result for iOS and Android devices.